Flat-panel TVs with 30 channels of HD programming. Easy-access Plug-and-Play feature makes it simple to connect electronics. 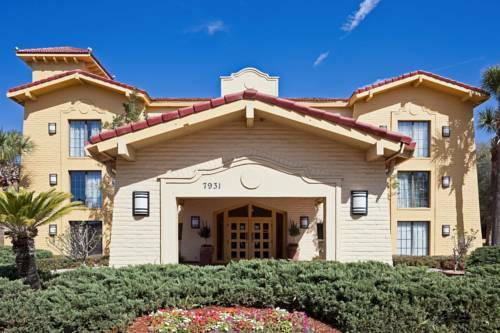 The La Quinta Inn Orlando Airport West is located a few miles northwest of Orlando International and close to the shores of Lake Conway. Our location near the Beeline Highway (exit 9) affords quick access to all local attractions including Magic Kingdom, Universal Studios, Sea World, and the Orange County Convention Center. Spend the day golfing, shopping, or visit area parks for a picnic and hiking. A short drive puts you at the sands of Cocoa Beach and Daytona Beach. Enjoy a refreshing swim and relax on the sundeck beside the heated outdoor swimming pool at the La Quinta Inn Orlando Airport West. Feast on our Free Bright Side Breakfast each morning in the lobby. Each of our spacious and comfortable guest rooms include free high-speed Internet access, a coffee maker, and free HBO. Meeting facilities are available, as well as free airport shuttle service. We are convenient for visitors to Cessna Flight Safety and the 143rd Army Transportation. Transportation service available through Guytour. Check rates online or call (407) 654-0209. All reservations must be canceled before 6pm local hotel time on the scheduled date of arrival to avoid being charged one night's room rate plus all taxes. Wax dummies of all the Presidents plus patriotic statues, murals, and architecture, a tray of cookies from the Bush White House, and other odd Presidential ephemera.